Rain Gutter Wickliffe | Gutter Manufacturer | MATTEO ALUMINUM, INC. When it comes to premium-quality rain gutter products, trust only MATTEO ALUMINUM, INC! We are a leading gutter manufacturer in Northeast Ohio. For more than 30 years, we have been meeting all the gutter needs of customers and corporations big and small, across the Country! From Aluminum to Copper, Residential to Commercial, we have everything you need. Most of our items are manufactured in our own 110,000 sq. ft. facility, enabling us to keep the product’s cost down, and the quality up. Our wide array of products is available for wholesale and retail purchases. Yes, we are open to the public! Stop in and pick up a color sample, we offer 42 colors to choose from. Putting your convenience as a priority, MATTEO ALUMINUM, INC. offers delivery with a minimum order. No matter where you are in the United States, one of our trucks are ready to distribute our gutter products right to your place of business. Our experienced, courteous drivers, provide prompt, on-time deliveries. 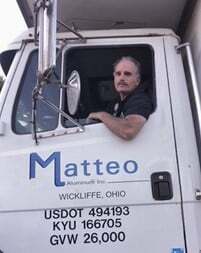 Call us at 1-877-MATTEO-1 or (440) 585-5213 for more details.